Show your best with this professional, book like finish. Documents bound with White GBC Velobind Hot Knife Binding Strips are great for filing, stacking and mailing. With GBC's patented Hot Knife binding technology, white spines permanently lock pages into place to keep reports and proposals secure. 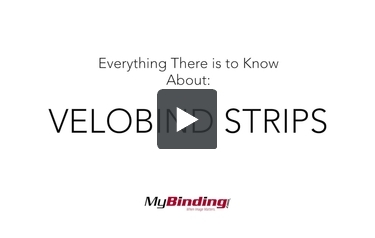 These White Velobind Binding Strips include 11 equally spaced pins (for 11" books) and are designed for use with GBC's line of Hot Knife Velobind Systems including the GBC V800pro Velobind System One , GBC Velobind System Two , GBC Velobind System Three Pro and GBC Velobind System Four "Bind" . Size:11" x 1" - 11" x 3"
I have used this strips for quite a long time and I have never had any problems with them. They are very good. Excellent product. I would like to purchase GBC Premium White 1" x 11" 4 Pin Velobind Strips. I can not locate them on this web Site? Thank you for your question. Unfortunately the 4 pin VeloBind strips are not available in white, just Navy or Black. You can find all of our 4 pins strip options here .